When Starbucks introduced the new design for this year’s holiday cups on Wednesday, many people were quick to wonder when the company’s supposed annual “war on Christmas” would have critics foaming at the mouth. So far, the arrival of the simple color-in cups hasn’t triggered the type of outrage seen in recent years, but it has ushered in something objectively better: a deal for free coffee. 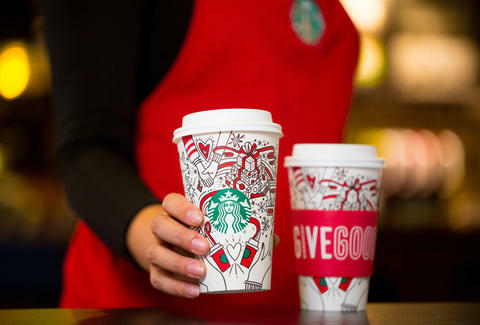 To celebrate its new “Give Good” holiday campaign this year, Starbucks will give you one free drink when you buy one of the following signature holiday beverages: Gingerbread Latte, Peppermint Mocha, Eggnog Latte, Chestnut Praline Latte, Caramel Brulée Latte, Holiday Spice Flat White, and Teavana Joy Brewed Tea. The buy-one-get-one (BOGO) deal is only good for a handful of days during a brief afternoon window — November 9 through November 13 from 2pm to 5pm -- at most locations in the United States and Canada, according to a press release. You'll still have to drop five bucks or so on a holiday drink to take advantage of the complimentary coffee, but now that Peppermint Mochas are finally back, you were probably going to do that anyway, right? This way, you'll have an extra one to gift to a friend, co-worker, stranger, or -- face it -- gulp down yourself now that the stress of the holidays is starting set in. Choose wisely. Tony Merevick is Senior News Editor at Thrillist and just realized he still hasn't had a Pumpkin Spice Latte this year. Send news tips to news@thrillist.com and follow him on Twitter @tonymerevick.